For a short period during the middle of the nineteenth century two scientists whose first names included Rudolf were professors in the medical faculty of the University of Würzburg -- officially the Julius – Maximilians -Universität Würzburg; the one came and left after six years while the other came and stayed the rest of his life. Although of altogether different personalities they benefitted immeasurably from one another’s company during their time together. The older of the two was Rudolf Albert (von) Kölliker (1817 – 1905) who chose to be known as Albert Koelliker; the younger was Rudolf Ludwig Carl Virchow (1821 – 1902). The older Rudolf, an anatomist, became the doyen of late nineteenth century histologists while the younger, a pathologist, has been described as “..... the greatest figure in the history of pathology “ . The archive of the present - day Institute of Pathology at Würzburg includes this photograph taken in 1850 of the prominent members of the Physikalische – Medizinischen Gesellschaft Würzburg: the two Rudolfs are standing at the back, Virchow on the left. Seated in front are: J.J. von Sherer, Franz Kiwisch von Rotterau and Franz von Rinecker. Figure 1. 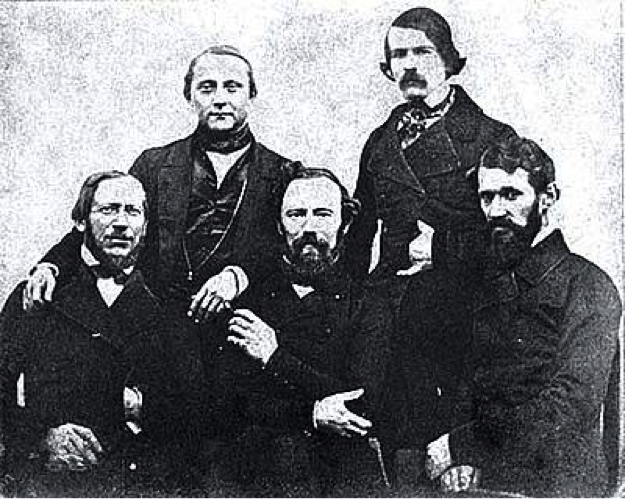 The Würzburger ‘Five’: the two Rudolfs are standing at the back, Virchow on the left. Seated in front are : J.J. von Sherer, Franz Kiwisch von Rotterau and Franz von Rinecker. Picture was taken in 1850, and is from Institute of Pathology at Würzburg. Johann Joseph Scherer (1814 – 1869) was a physician and chemist. Franz Kiwisch von Rotterau (1814 – 1852) was regarded as one of the foremost gynaecologists in Germany; a Czech he died in Prague at the age of 38 from tuberculosis. The oldest of the five was Franz von Rinecker (1811 – 1883) a ‘Polikliniker’, dermatologist and pharmacologist and Dean of the medical school. He had recruited Koelliker and Virchow. The caption of the photograph reads: ‘Gleich nach einer Ankunft in Würzburg im Herbst 1849 fand Virchow guten Kontakt zu seinen Kollegen an der medizinischen Fakultät, besonders zu den jüngeren Forschem, die erst kürzlich nach Würzburg berufen worden waren. Das 1850 entstandene Gruppenbild zeigt Virchow im Kreise von 4 Kollegen, die zusammen als Zugpferde der medizinischen Fakultät maβgeblichen Anteil am Aufstieg Würzburg nach 1848 zur medizinischen Hochburg Deutschlands hatten’ (Immediately after his arrival in Würzburg during the autumn of 1849, Virchow established good contact with his colleagues at the medical faculty, especially with the younger researchers who had only recently been appointed. This group photograph shows Virchow and the four colleagues who were mainly responsible for the rise of the Würzburg medical faculty to become the leading medical institution in Germany). The foundation of the Gesellschaft in 1849 was mainly due to Koelliker who saw the need for a forum where like - minded researchers could meet and discuss their work. Koelliker and Virchow both had had the advantage of being taught in Berlin by Johannes Petrus Müller (1801 – 1858), a pupil of Karl Asmund Rudolphi 1771 – 1832). Müller was one of those people who comes along every now and then. He was born at Koblenz on 14 July 1801 where his father was a cobbler . Although destined for the priesthood he decided at the age of 18 rather to go to the newly established University of Bonn to study medicine and graduated in 1822. The next year he continued his studies at the recently founded University of Berlin (Humboldt – Universität zu Berlin) under Rudolphi who was an accomplished microscopist. Eighteen months later Müller returned to Bonn with a microscope Rudolphi had given him. Müller was a dynamic teacher and emphasized the need for closely observed facts and less reliance on Romantic Natural Philosophy*. When Rudolphi died in 1832 the chair was offered to two eminent professors who both declined the invitation. On hearing this Müller wrote to the Prussian Minister of Religious, Educational and Medical Affairs Baron Karl von Stein von Altenstein (1770 – 1840), the minister responsible for the appointment, putting forward his suitability for the post. He was appointed and started in Berlin in early 1833 and taught anatomy, physiology and later pathology. His Handbuch der Physiologie des Menschen für Vorlesungen which was published in sections between 1833 and 1838 was widely used and translated into several languages, including English. “ Müller’s entire scientific production encompassed twenty independent writings and over two hundred smaller and diverse publications, a truly immense accomplishment and proof of genius and industry” . This was an amazing achievement considering that the small rooms he, his assistants and his students had to work in were dark, cramped and foul – smelling, and had insufficient light and ventilation; several chose to work in their own living quarters (It was only in the 1860s that the universities provided scientists with the facilities and space they needed for their experiments). In 1834 Müller had founded Archiv für wissenschaftliche Anatomie, Physiologie und Medicin which soon became one of the most prestigious scientific journals. Müller was Dean of the Medical Faculty between 1835/6 and 1842/3 and Rector of the University between 1838/9 and 1847/8. In March 1848, during the uprising of the citizens and students of Berlin against the feudal system, he stood guard at the entrance to the medical school. Müller suffered from depression and periodically needed prolonged periods off work to recuperate; he may have taken his own life during a severe depressive episode following his survival of a shipwreck while returning from an expedition in the Baltic in September 1855 in which the student accompanying him drowned. After his death the university created separate chairs of anatomy, physiology and pathology of which Virchow was the first incumbent. Posen – born Robert Remak (1815 – 1865). He was probably Müller’s most brilliant student. In 1836 he proved that nerve fibres and nerve cells were connected to one another. By 1841 he had accumulated enough evidence to challenge the popular opinion of the time that new cells arose spontaneously from the surrounding fluid and later came to the conclusion that tumour tissue was not the creation of new tissue but the transformation of normal into pathological tissue. This fact formed the basis of Virchow’s work on pathology once he (Virchow) had come around to accept the correctness of Remak’s opinion . The annals of the history of anatomy and physiology have not been kind to Müller’s former teacher Rudolphi. Of him Müller once said: “Every time he had the opportunity, Rudolphi would express himself in rather strong terms against a study of nature based on a series of misinterpreted philosophical principles “ . Rudolphi was born in Stockholm to German parents on 14 July 1771 and trained at the University of Greifswald (which until 1815 was part of Sweden) and was awarded his doctorate in 1795. He worked widely across the fields of botany, zoology and physiology and had a special interest in round worms. In 1810 he went to Berlin as the first holder of the joint chair of anatomy and physiology and remained in the post until he died from “wassersucht” (dropsy) on 29 November 1832 at the age of 71. He did two terms as Rector of the University and founded the Berlin Zoological Museum. Incidentally, Rudolphi was indirectly responsible for an important event in the history of neuroscience -- the first description of the nerve cell by Jan Evangelista Purkynĕ 1787 – 1869) on 23 September 1837. Rudolphi was one of a panel of eminent Berlin professors who in 1823 advised Baron von Altenstein to appoint Purkynĕ to the chair of physiology at Breslau despite strong opposition from the local medical faculty who thought him not suitable for the post. To crown this association 40 year old Jan Evangelista Purkynĕ married Rudolphi’s 27 year old daughter Julia Agnes on 24 September 1827 . Koelliker was born in Zurich on 6 July 1817. His father Johannes Kölliker (1790 – 1833) was a bank official and his mother Anna Füssli (1796 – 1860) came from a family of fine book publishers. As a schoolboy he was interested in botany and continued studying the subject at Zurich University before turning to medical subjects. He spent the spring of 1839 at Bonn before going to Berlin and when Henle was appointed Professor of Anatomy at Zurich in 1840 Koelliker became his assistant. Henle was not happy in Zurich and when he went to Heidelberg in May 1844 the 27 year old Koelliker succeeded him as Professor Extraordinary of Comparative Anatomy and Physiology. Seven semesters later Koelliker accepted the post of Professor of Comparative Anatomy and Physiology at Würzburg and started there in September 1847 . Virchow was born on 13 October 1821 in Schievelbein in rural Pomerania (now Swindin in NW Poland). He was the only child of Carl Christian Siegfried Virchow (1785 – 1865), a small farmer and treasurer to a business in town, and his wife Johanna Maria Hesse (1785 – 1857); the couple bickered a lot. Virchow was a brilliant but rebellious scholar -- despite his short stature his classmates called him ‘King’ -- and wanted to be a priest but this ambition was thwarted by his weak voice. In 1839 he was accepted in the Friedrich – Wilhelms Institute or pépinière in Berlin which provided free medical education for gifted boys who would later be employed as army doctors. He graduated in 1843 and went to the Charité Hospital to continue his study of pathological anatomy under Robert Froriep (1804 – 1861). In 1847 he and another confident young man Benno Ernst Heinrich Reinhardt (1819 – 1852) launched the journal Archiv für pathologische Anatomie und Physiologie und für klinische Medizin which was soon widely read and became known as Virchow’s Archive after Reinhardt’s death from tuberculosis on 11 March 1852; Virchow continued to edit the journal until his death in 1902 (169 volumes). In 1847 Virchow was sent to investigate an outbreak of typhus fever that ravaged famine – ridden Upper Silesia and wrote a report that was critical of the Prussian authorities and the entrenched feudal – bureaucratic system. Back home he contributed to Die medizinische Reform, the Berlin mouthpiece of a nationwide movement to reform medical practice, and took an active part in the political revolution that swept through Europe during 1848. This was all too much for the authorities and he was expelled from his university post. On hearing this von Rinecker in Würzburg immediately recruited the 28-year old Virchow as Professor of Pathology to replace Bernhard Mohr (1808 – 1848), the first incumbent of the second chair of pathology in German-speaking countries after Vienna, who had just died from tuberculosis . During the years that Koelliker and Virchow worked together at Würzburg each of them produced the first parts of textbooks that would become the standard bearers of normal human histology and of pathology, respectively, not only in German – speaking countries, but all over the world. In 1852 Wilhelm Engelmann of Leipzig published the first half of Koelliker’s Mikroskopische Anatomie oder Gewebelehre des Menschen; the second half followed in 1854. An English edition of volume one was published by The Sydenham Society in London in 1853, an American edition in Philadelphia in 1854, an Italian edition in Milan in 1856, and a French edition in Paris in 1856. Virchow, on the other hand, wrote the introductory chapters of his six – volume Handbuch der speciellen Pathologie und Therapie during 1854. These chapters formed the basis for the book that made him famous: Die Zellularpathologie in ihrer Begründung auf physiologische und pathologische Gewebelehre of 1858, a book that was the compilation of a series of twenty lectures he had given during February, March and April that year “.... in the presence of a somewhat numerous assembly of medical men for the most part physicians practising in town “ . The lecture of 17 February included the often – repeated aphorism: “ Where a cell arises, a cell must previously have existed (Omnis cellula e cellula), just as an animal can spring only from an animal a plant only from a plant “ . Koelliker’s motivation for writing his book is mentioned in his autobiography of 1899  : “In meiner mikroskopischen Anatomie Mikroskopische Anatomie oder Gewebelehre des Menschen die in den ersten Jahren meiner Thätigheit in Würzburg (1850 – 1854) entstand, versuchte ich alle Organe des Körpers nach ihrem feinsten Baue zu schildren ein Unternehmen, das noch von niemand in dieser Weise durchgeführt worden war. Die meisten der früher erschienenen Arbeiten behandelten wesentlich nur die Elementarteile, wie die Werke von Henle, Bruns, Gerber, Gerlach, Bendz, Hassall u A., oder waren, auch wenn sie den Bau von zusammengesetzten Organen schilderen, wie Todd und Bowman, nicht ausführlich und vollständich genug “. Later he explains further: “Schon während der Abfassung der mikroskopischen Anatomie machte sich bei mir das Bedürfnis nach einem minder ausführlichen Werke geltend, in welchem die Errungenschaften der neuen Disziplin, als welche die mikroskopische Anatomie wohl bezeichnet werden konnte.... und so entstand schon im Jahre 1852 das Handbuch der Gewebelehre für Ärtze und Studierende, welches dann im Laufe der Zeiten fünf vollständige Auflagen erlebte und in einer sechsten in neuer Form zu erscheinen begonnen hat “ (In my microscopic anatomy (Mikroskopische Anatomie oder Gewebelehre des Menschen), which was written during the first years of my time in Würzburg (1850 – 1854), I attempted to depict all the organs in the body in the finest details, something which had not been done before. Most of the earlier publications treated only the basic structure of the organs such as those of Henle, Bruns, Gerber, Gerlach, Bendz, Hassall and others, or, even if they treated the structure of complete organs, as Todd and Bowman did, were incomplete and not in enough detail. (Later he explains further). Already while working on the microscopic anatomy, I realised the need for a less detailed book illustrating the achievements of the new discipline, which microscopic anatomy was now becoming, and so in 1852 the Handbuch der Gewebelehre für Ärtze und Studierende appeared, which in time saw five editions (1852, 1855, 1859, 1863, 1867); a sixth revised edition is about to be published). This sixth edition was published in three volumes in 1889, 1896 and 1902; the latter in co-operation with Victor von Ebner (1842 – 1925), Professor of Histology in Vienna. Perusal of the six editions of the book, and the titles of his scientific publications, reveals that Koelliker had a special interest in the histology of the nervous system; all of the 874 pages of the 1896 volume are devoted to the subject. In all Koelliker produced 305 scientific writings. It should also be noted that he and fellow Würzburger Carl Theodor Ernst von Siebold (1804 – 1885), a noted zoologist, in 1848 had co -founded Zeitschrift für wissenschaftliche Zoologie. This soon became regarded as one of the leading biological journals in Europe -- if not the whole world -- at a time when German was the language of science. The journal ceased publication in 1973 after 186 volumes. In contrast to Koelliker’s somewhat diffident justification for writing yet another book on the histology of human tissues, Virchow’s preface is written in a more robust vein: “ The object chiefly aimed at in them.... was to furnish a clear and connected explanation of those facts upon which, according to my ideas, the theory of life must now be based, and out of which also the science of pathology has now been constructed. They were more particularly intended as an attempt to offer in a better arranged form than had hitherto been done, a view of the cellular nature of all vital processes, both physiological and pathological, animal and vegetable, so as distinctly to set forth what even the people have long been dimly conscious of, namely, the unity of life in organized beings, in opposition to the one – sided humoral and neuristical (solidistic) tendencies which have been transmitted from the mythical days of antiquity to our own times, and at the same time to contrast with the equally one – sided interpretations of a grossly mechanical and chemical bias – the more delicate mechanism and chemistry of the cell “ . Koelliker and Virchow became close friends at Würzburg and before Virchow returned to Berlin in 1856 to be the Director of the Pathological Institute, the Physikalisch – Medizinischen Gesellschaft held a farewell dinner on 9 August 1856. Virchow was given a painting of Würzburg. Koelliker’s presidential address ended with these words: “ Lieber Virchow ! So nimm es denn hin, dieses Bild, in Liebe und Freundschaft, wie wir es Dir geben. Denke, wenn Du es betrachtest, an die reichen Fluren und blumigen Höhen des Frankenlandes, die Du so gern durchstreiftest und in denen Du so manche schöne Stunde in reinem Genieβen verlebtest. Denke aber auch dabei an uns und bewahre uns stets die Liebe und Treue, die uns hier verband “ (Dear Virchow ! So take this picture along with you, presented with love and friendship. When you look at it think of the rich meadows and flowery heights of Franconia, which you explored with such pleasure for many good hours. Think fondly also of us, and always treasure the love and faith that connected us here) . When Koelliker went to Würzburg in 1847 to teach physiology and comparative anatomy he did so on the understanding that he would also teach anatomy when that chair became vacant. After the death of the incumbent Martin Münz’s (1785 – 1848) Koelliker in 1849 became the head of both the anatomy and physiology institutes. To help him with his various tasks -- he taught physiology in the summer and human anatomy in the winter -- he had the help of three exceptionally able assistants, Heinrich Müller (1820 – 1864), Franz Leydig (1821 – 1908) and Carl Gegenbaur (1826 - 1903); Gegenbaur went to Jena in 1856 and Leydig to Tübingen in 1857. Müller took over the teaching of comparative anatomy when he became Ordinarius in 1858 but when he died unexpectedly in 1864 the chairs of anatomy and physiology were separated and thereafter Koelliker taught only anatomy and histology. Albert von Bezold (1836 – 1868) became the first Professor of Physiology but he died not long afterwards at the age of 32 from the consequences of mitral stenosis. Koelliker continued to do microscopic research on a variety of biological topics all his life. It was during this period that the understanding of the histology of the nerve cell (neuron) shifted from the belief that all the cells of the nervous system were joined together in the form of a big mesh - the Reticular Theory - to the proof that the nervous system of humans (and animals) was made up of millions of individual cells – the Neuron Doctrine. In the accumulation of this knowledge Koelliker played a big role, not only as a researcher, but also because he instantly recognised the significance of the work of Santiago Ramón y Cajal (1852 – 1934) of Barcelona whom he had met at the Congress of the German Anatomical Society held in Berlin during the first fortnight of October 1889. Koelliker went out of his way to promote Cajal to the extent that he learnt Spanish so that he could report on Cajal’s latest histological observations in his zoological journal. Cajal acknowledged his debt to Koelliker in his autobiography: “ I am very deeply grateful to the distinguished master of Würzburg. There is no doubt that the truth would have made itself clear eventually. Nevertheless it was due to the great authority of Kölliker that my ideas were rapidly disseminated and appreciated by the scientific world ” . In 1906 Cajal (now in Madrid) shared the Nobel Prize for Physiology or Medicine with Camillo Golgi (1843 – 1926) of Pavia whose capricious silver stain for nervous tissue he had mastered and improved on. It was mainly due to Cajal that it was eventually agreed that the cells of the central nerve system were contiguous with but not continuous with one another. Koelliker died in Würzburg on 2 November 1905 at the age of 88 after a short illness caused by a pulmonary embolus while he was still hard at work. Virchow’s post - Würzburg career can be summarized by the title of Erwin Heinz Ackernecht ‘s (1906 – 1988) 1953 biography of him: Rudolf Virchow Doctor Statesman Anthropologist . Virchow busied himself with improving the sanitation and quality of the drinking water of the Berliners: “Virchow’s work in public health was so extensive and many sided that one might fairly state that the average German of 1900 had benefitted from it in almost every phase of his life from the cradle to the grave, whether eating or drinking, going to school or working, whether healthy or sick in hospital”. .
Virchow remained politically active all his life. He was elected to the Berlin City Council in 1859 and was a member of the Reichstag from 1881 to 1893. With others he formed the German Progressive Party and was the nemesis of autocratic Prime Minister (later Chancellor) Otto von Bismarck (1815 – 1898) who famously challenged him to a duel on 2 June 1865 (the “sausage duel” was called off). Virchow campaigned for a liberal society with equal rights for all its citizens. Ackernecht’s assessment is that “Quantitatively Virchow’s political contribution is no less extensive than his scientific contribution” . In 1869 Virchow was a co-founder of the German Anthropological Society and the Berlin Society for Anthropology, Ethnology, and Prehistory of which he was President and editor of its journal until his death. He befriended Heinrich Schliemann (1822 – 1890), the discoverer of the site of Troy, and accompanied him there in 1879 and to Egypt in 1888. Ackernecht does not say what Virchow thought of Koelliker and Virchow did not write his own biography, but the two friends continued to exchange letters on professional matters which at times included enquires about the other’s family. Virchow jumped off a moving tram in Leipziger Straße in Berlin on 4 January 1902 and broke one femur. This fracture never healed and after a protracted illness he died at 13h00 on 5 September 1902 and was buried four days later; he was 81 years old. For their contributions to human histology -- normal and pathological – the seven years that Albert Koelliker and Rudolf Virchow spent together in Würzburg in the middle of the nineteenth century could be described as a “A Marriage made in Heaven”, but they would both have readily acknowledged their indebtedness to their teacher Johannes Petrus Müller who had passed on to them the scientific idiom and microscopic skills he had learnt from Karl Asmund Rudolphi. * Karl Eduard Rothschuh (1908 – 1984) historian of physiology from Münster explains: “One of the most bizarre episodes in the history of physiology occurred during the period of the so-called “romantic” medicine. It all began with the arrival of the idealist philosopher Friedrich Wilhelm Joseph von Schelling (1775 – 1854) in Jena during the year 1798. The new approach culminated in the years 1810 – 1815, and slowly declined thereafter. The entire period was characterized by a tendency to derive medical theory and practice from philosophical considerations about nature rather than from experience.... It was an outgrowth of the romantic movement which dominated Germany’s contemporary intellectual life..... These ideas were based primarily on Schelling’s “Naturphilosophie”, although there were several schools and currents of opinion” . I am a long - retired gastro-enterologist with no academic association and paid for the expenses incurred out of my own pocket. I would like to acknowledgement the help of librarians Jutta Schöffel and Sabine Tolksdorf (National Library Berlin) and Helga Seifert (Pathological Institute Würzburg) with information gathering, Hermann Wittenberg with the German into English translations and Mary Bock with matters editorial. The essay was recommended for publication by Professor Robert Porter, one-time Professor of Physiology and Dean of the Faculty of Medicine of Monash University, Professor J.C. de Villiers Emeritus Professor of Neurosurgery, University of Cape Town and Larry W. Swanson, Appleman Professor of Biological Sciences, Neurology, and Psychology, University of Southern California. Long E.R. A History of Pathology. New York: Dover Publications, Inc.; 1965: 117. Johannes Petrus Müller ( 1801 – 1858 ) mpiwg – berlin.mpg.de. Downloaded 03 January 2017. Rothschuh K.E. History of Physiology. Translated by G.B. Risse. Huntington, New York: Robert E. Krieger Publishing Company; 1973: 203. Major R.H. A History of Medicine. Springfield Illinois U.S.A: Charles C. Thomas Publisher; 1954: 797. Harris H. The Birth of the Cell. New Haven and London: Yale University Press; 1999: 94 – 116. Harris H. The Birth of the Cell. New Haven and London: Yale University Press; 1999: 128 – 137. Rothschuh K.E. History of Physiology. Translated by G.B. Risse. Huntington, New York: Robert E. Krieger Publishing Company; 1973: 196. Bock O. Jan Evangelista Purkynĕ and the histology of the nerve cell: frustrations and setbacks at Breslau. Research 2017; 4: 2115. Otremba H. Albert von Koelliker Anatom und Histologe 1817 – 1905. Würzburg: Echterhaus; 1986. Otremba H. Rudolf Virchow Begründer der Zellularpathologie. Würzburg: Echterhaus; 1991. Virchow R. Cellular Pathology as based upon Physiological and Pathological Histology. Translated by F. Chance. Philadelphia: J.B. Lippincott and Co.; 1863: v.
Virchow R. Cellular Pathology as based upon Physiological and Pathological Histology. Translated by F. Chance. Philadelphia: J.B. Lippincott and Co.; 1863: 54. Koelliker A. Erinnerungen aus Meinem Leben. Leipzig: Wilhelm Engelmann; 1899: 189. Otremba H. Albert von Koelliker Anatom und Histologe 1817 – 1905. Würzburg: Echterhaus; 1986: 17. Ramón y Cajal S. Recollections of my Life. Translated by E.H. Craigie. Cambridge, Massachusetts and London, England: MIT Press; 1989: 358. Ackernecht E.H. Rudolf Virchow Doctor Statesman Anthropologist. Madison: The University of Wisconsin Press; 1953. Ackernecht E.H. Rudolf Virchow Doctor Statesman Anthropologist. Madison: The University of Wisconsin Press; 1953: 137. Ackernecht E.H. Rudolf Virchow Doctor Statesman Anthropologist. Madison: The University of Wisconsin Press; 1953: 189. Rothschuh K.E. History of Physiology. Translated by G.B. Risse. Huntington, New York: Robert E. Krieger Publishing Company; 1973: 155.